Meet Your Own Fertility Specialist Today! Parenthood is a dream for almost every couple. However, a large number of couples are facing infertility conditions, that deprive them of parenthood. In fact, one in every six couples is affected by some degree of infertility. With more couples having difficulties with conception due to lifestyle, stress and age, intervention through fertility treatments is becoming more and more necessary. Oasis offers couples the comfort and convenience of consultations, investigations and advanced treatments by highly experienced and trained fertility experts and embryologists, all under one roof. We, at Oasis, strive to give each of our patients a personalized treatment and the care they deserve, doing so with utmost confidentiality. We recognize couples’ need for an approach that is both compassionate and competent. Since it’s inception in 2009, Oasis has established itself as a trusted healthcare service provider in the field of reproductive medicine. Take a tour of Oasis, Our treatments and Our state of the art laboratories. Male Infertility can be psychologically and physically taxing for most men. Here at Oasis we have a range of infertility treatments that generate great results. Female Infertility can be very stressful for women both due to medical and social reasons. At Oasis we make sure the treatments are administered in a secure and caring environment. High Success rates and ever increasing happy couples. We provide individual treatment plans tailored specifically to your needs. A family friendly center addressing all infertility needs and offering medical and psycho-social support throughout the journey. Our expert team is adept in addressing any of your fertility needs and we at Oasis pride ourselves in offering efficient and evidence based fertility treatments such as IUI, IVF, IVM, PGS etc. Take a tour of Oasis, our treatments and "one of our state of the art laboratories". Can You Conceive If You Had Ovarian Cysts? 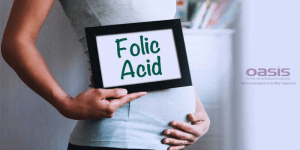 Does Folic Acid Increase Fertility? On the path to parenthood, time is of the essence.